Op-Ed: Is There Any Danger Of Death Threats On Candidates? In 2012, Senator Marco Rubio, R-Fla., was the target of a threat deemed credible enough to merit police protection in Washington, D.C., and at his home in West Miami, according to his office and Fox News. That same year, multiple (mostly right-wing) sources reported that Mitt Romney received death threats on Twitter (though most did not seem serious). In 2009, the respected British newspaper The Telegraph wrote that President Obama was receiving around 30 death threats a day. This raises the question: is it possible – or plausible – that some people may threaten candidates like Ted Cruz, Marco Rubio, or John Kasich, or even Trump to step down? Will there be immense pressure on them to step down? Are some supporters getting over-zealous? What about death threats? The serious nature of some Republican debates make it seem plausible. Marco Rubio has already received death threats in his career – could it happen again? Posted on March 4, 2016 April 17, 2016 by reasonablyliberalPosted in UncategorizedTagged abuse, bullying, death threats. Another Death From The Epidemic Of Violence And Bullying In The U.S.
A California teen who killed himself after years of bullying has sparked a community discussion about the destructive behavior while raising questions among his family about the way he was treated. Adam Kizer, a 16-year-old sophomore at Sonoma Valley High School near San Francisco, died Saturday at a hospital after being taken off life support, his family said. He hung himself four days earlier and did not respond to life-saving efforts, said his father, William Kizer. Mr. Kizer said his son had been a target of bullying since elementary school in Wyoming, where other kids once bound him and poured gasoline on him. According to pressdemocrat.com, the abuse continued in Sonoma after the family moved there in 2011, with students at Sonoma Valley High picking on the slightly built teen with shaggy hair, encouraging him to take his own life, the father said. In a show of community support, about 200 people attended a vigil Sunday night at the Sonoma Plaza. Makeshift shrines could be seen at a park near the school as well as on campus, where students were taking final exams before the end of the school year. Reddit is updating its policies on harassment and bullying. They will be taking a more active role to protect individuals while hoping to maintain their hands-free approach to moderation and community building, writes the Canadian Broadcasting Corporation. Administrators praised the social media network’s growth since its launch 10 years ago and also addressed a growth in harassment directed at individuals, writs the CBC. They addressed specifically the posting of people’s private information, or links to people’s private information, without their consent (known as doxing). A 15-year-old California girl hanged herself a week after three classmates photographed themselves sexually assaulting her at a 2012 party. She reportedly was petrified the boys would circulate the photos online and believed gossip about her was spreading widely, according to philly.com. And perhaps it was spreading widely. Audrie Pott’s story has captivated those concerned with teen bullying, which appears to be on the rise with the help of smartphones and social media. A wrongful death trial this month in San Jose will determine whether bullying played a role in the girl’s suicide. What do you think? Lawyers are scheduled to argue Wednesday over what evidence the jury will hear, while opening statements are expected to start next week. The three boys, now high school seniors, and other teens are expected to deliver uncomfortable and emotional testimony about the party where Audrie was sexually assaulted after passing out drunk, as well as about other events leading up to her death. Is Loser.com The Worlds Biggest Troll? But before you feel too bad for Kanye, consider that Loser.com has also lambasted President Obama, Reddit. and Al Gore. In fact, according to The Washington Post, Loser.com has been calling people schoolyard insults, in quiet, pointless obscurity, for the past 15 years. Loser.com may just be the best troll you’ve never heard of, according to The Washington Post. “The conceit of the gag is pretty basic. Someone, somewhere in the world registered the domain “loser.com” in 1997. (Early evidence suggests this person was a guy named Steven Armato, who liked “yo mama” jokes and Apple computers. ),” states the Post. In 2000, for instance, Loser.com took you to the Web site of Al Gore, the person who “lost” that year’s election. 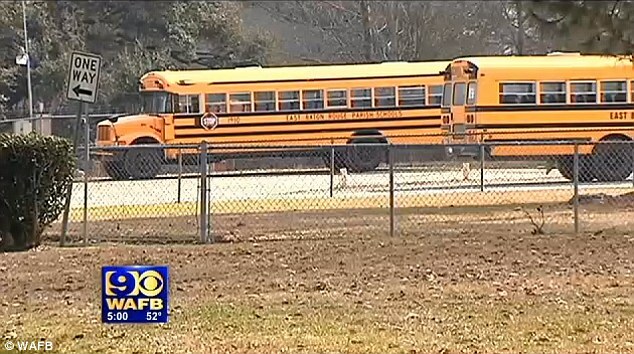 A 14-year-old Louisiana boy is being hailed as a hero for stopping an out-of-control school bus filled with high school students after a classmate knocked the driver unconscious, according to the Daily Mail. The 15-year-old suspect has been charged with assault for attacking the 26-year-old driver in Baton Rouge Thursday as she was dropping off about a half-dozen students from Christa McAuliffe Superintendent’s Academy. The academy is an alternative school for teens with disciplinary problems. Police and school officials say the female driver had stopped the bus at around 3pm at Linden Street to exchange words with the disruptive student. According to the driver, when she turned away to face the road, the 15-year-old walked up behind her and punched the woman several times in the head until she passed out. She then lost consciousness, her hands and feet slipped from the wheel and the brakes, and the bus started moving again. That is when Tay’veon Slaughter, 14, jumped into action. The quick-thinking eighth-grader slammed his foot on the breaks to stop the bus from crashing and called 911. The 15-year-old suspect in the attack fled the bus before police responded to the scene. Later that day, the teenager’s mother turned him in to police. The suspect was arrested on charges of battery of a bus operator, aggravated obstruction of a roadway and second-degree battery. School officials say the 15-year-old has been suspended pending a disciplinary hearing and could face expulsion. When the driver of the bus woke up, she did know she had been attacked and that her face was swollen. The injured driver was taken to a hospital to be treated for her injures. She has since been released to continue her recovery at home. Slaughter said that before the attack on the driver, the 15-year-old was throwing things out the widow and spitting at passing cars. The boy reportedly became upset when the driver asked him to stop and sit down. When the 26-year-old woman regained consciousness, Slaughter said she did not know she had been punched. ‘She didn’t know that her face was swollen,’ the boy recalled to the New Orleans Advocate. Averil Sanders, principal of Christa McAuliffe Superintendent’s Academy, said he was proud of Tay’veon for stepping up to the plate in an emergency situation. Rapper Iggy Azalea has decided to take a break from using social media after seeing some “shocking” comments about her body online. “Since claiming she would be quitting social media last night, it looks like the rapper has done just that,” says ABC News.